As many of you know, I’ve been working toward becoming a professional genealogist for some time now. For over three years, my primary focus has been genealogical education. 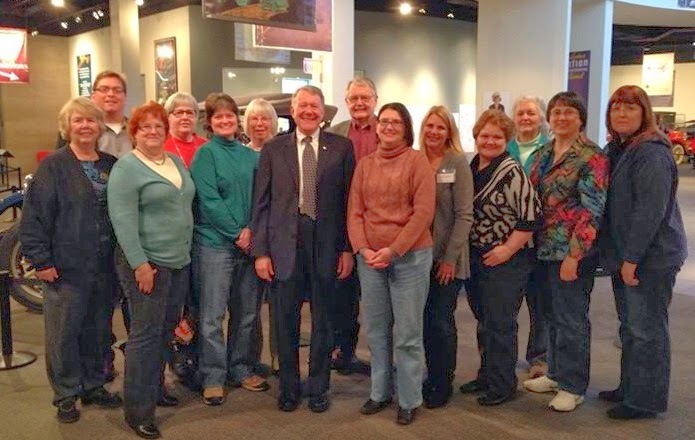 I’ve completed the 15-part NGS American Genealogy Home Study Course and the 18-month ProGen Study Group program. I’ve attended institute weeks at SLIG in Salt Lake City and IGHR at Samford University, as well as state and national conferences. Gradually, I began doing research for friends, associates, and clients. And now I'm pleased to announce that my new business website, Buckeye Family Trees, is up and running! My professional focus is on Ohio research. It just makes sense for me—I’ve lived in Central Ohio all my life, am familiar with the libraries and archives around here, and have been using these records for years to research my own family lines. I’m looking forward to helping others whose ancestors lived in or traveled through the Buckeye state. Rest assured that I’ll still be blogging away here as usual at A Sense of Family. I really enjoy sharing my research adventures (and misadventures) with you, my dear readers, and hope to continue for a long time. I thrive on your comments and relish the encouragement and support within the genea-blogging community. In fact, I just wrote an article on genealogy blogs for the 2012 Ohio Genealogical Society Writing Contest—and won first place in the Ohio Genealogy News category! I was thrilled to hear the contest winners announced at the recent OGS Conference. 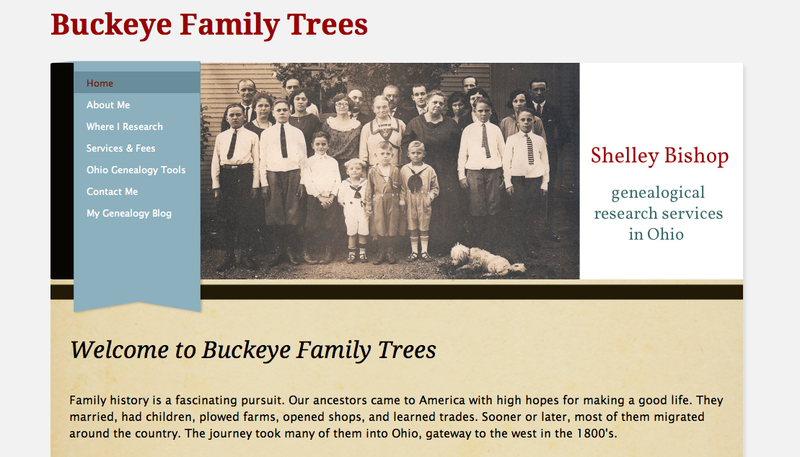 So when you get a chance, head over to Buckeye Family Trees at www.buckeyefamilytrees.com and check out my website. I’m still fine-tuning and adding to the pages, but I just couldn’t wait any longer to debut it. What do you think of it? Looks great, Shelley! Congrats on taking the next step. Thanks, Tina! I was a little hesitant, but I'm glad I did. Buckeye Family Trees looks great!! I wish you well! I appreciate it, Dorene! So glad to have met you at the OGS conference! Way to go, Shelley! Love the design of the new site--and that front page photo! Thanks, Amy. Isn't that photo amazing? Still trying to identify each individual and pinpoint which of the little boys in the front row is my grandfather. Your new site is fantastic! Like Amy I love the lay-out and colors. It's beautiful to look at and super easy to navigate! Congrats! All your hard work shows! I appreciate your comments so much, Cindy! You don't know how long I toiled over the layout, colors, and navigation. So glad you like it! Looks great! Congratulations on your accomplishments!! Thanks, Jenna, glad you like it! Yeah, scary is right, Susan. But putting the website together actually turned out to be fun, and that propelled me forward. Of course it helps that I didn't have to learn any coding. That would really be scary! Looks great! And being an Ohio girl myself I really appreciate the Ohio Genealogy Tools tab!! I was hoping people would find that helpful, Diana! I still want to add a few more things to it. Congratulations, Shelley! How did I miss that you were headed toward professional genealogy? Your new website is beautiful. It's so clear and easy to navigate with precise information. Just what someone desiring to hire a professional would want to know. I hope you get lots of business. The photo there is fabulous! Thanks for much for the kind words, Nancy! The site looks great, Shelley. And congratulations on your writing award - it's a double bonus week! Appreciate it, Malissa. It's been a whirlwind, but I have to admit it's nice to have this kind of week every once in awhile! I think the new blog is really going to be wonderful. I am researching just my own family lines and it is a lot of hours and each find is a real treasure. I found you looking for Evans which is my husbands line. Best of luck with your Evans research, Mary. I hope you find the family you're looking for in Tennessee. Keep at it--the hours of work are worth it! Fabulous! I'm happy to know an expert in Ohio as I suspect I may be needing your assistance down the road.